Everything should be simple…especially cocktails! That’s where simple syrup comes in. “…I really love cocktails this time of the year but they are so expensive at Moscow restaurants. It would be great to make them at home for my guests. I’m not very creative but I would love something more summery and interesting than just a vodka and tonic. I’d also love to make a Moscow Mule but I can’t find any ginger beer. Can you help? Well first of all, Theresa, many thanks for the note! I love hearing from readers like you, and I always enjoy solving culinary problems. And this is a REALLY simple fix. Really, really simple. This refrigerator staple is the foundation of many summer cocktails — it’s quick and easy to make, it keeps in the fridge for at least a month and it is a marvelously blank canvas on which you can — and you should — build flavor by infusing the syrup with herbs and fruits. Simple Syrup is the foundation for great lemonade and limeade as well, ensuring that your beverage strength stays consistent. Combined with fresh juice and garnished with mint or any other summertime herb, this is a great way to prepare refreshing non-alcoholic beverages for the teetotalers in your life. 1. Combine the sugar and water together in a sauce pan. Place over medium heat and stir until the sugar is dissolved. 3. Remove from heat, cool to room temperature. 4. Store in a non-reactive glass container in the refrigerator for up to two months. Recipe notes: some cocktails call for “honey syrup.” Substitute honey for sugar and proceed. Some cocktail recipes call for “rich simple syrup.” As the name suggests, this is a sweeter, more concentrated syrup. It’s also dead easy. Just increase the ratio of sugar to water. Recipe notes: some cocktails — particularly ones that are anchored with the “brown” liquors such as tequila, bourbon, scotch, rye, or brandy may recommend you use a brown sugar simple syrup. Substitute Turbinado for white sugar and proceed as above. So, now you’ve got your base (got your base, got your base…) it’s time to get creative. You can infuse anything into a syrup but here are a few I think are just great and which you will need to mix up the cocktails below. 2. Bring to a brief boil. 4. Remove from heat, cool, covered to room temperature. 6. Store in a non-reactive glass container in the refrigerator for up to two months. 2. Toss the fresh berries with the sugar, then gently macerate the berries with the sugar — don’t overdo it, but initiate the breakdown of the berry flesh. 3. Bring to a brief boil. 5. Remove from heat, cool, covered to room temperature. 7. Store in a non-reactive glass container in the refrigerator for up to two months. 3. Bring the sugar to a brief boil. 45 ml (3 Tbl) of whole coriander seeds, crushed slightly with a mortar and pestle. Recipe notes: You can also use this method with caraway seeds and celery leaves for a fantastic kick to any celery-based drink. Note: When I say “zest” I don’t mean the zest and the pith. Use a vegetable peeler to remove just the outer layer of the skin, not the white pith. Use a very sharp kitchen knife to julienne the zest into strips. 2. Bring the sugar to a brief boil. Experiment with combinations such as lemon and mint, basil and lime, grapefruit and pommagranate, orange and ginger. This is the best way to make lemonade, rather than simply slicing the citrus and adding it to water and hoping for the best. Mix the simple syrup, fresh citrus juice, and water in a ratio of 2:1:4 and add ice. So, now that your fridge is chocker block with simple syrups of every imaginable variety, its time to mix up cocktails! The supply side for Moscow is always in flux, isn’t it? To stick to my theme of keeping it simple and affordable, the recipes below are mainly for vodka with a few tequila, rum, and gin recipes thrown in to keep it interesting. For best results, use fresh fruit juice and chill your cocktail glasses ahead of time. These are based on existing recipes, but tweaked to ensure that all of the ingredients are available in Russia, the names are my own. Combine the vodka, elderflower liqueur, pomegranate juice, lime juice and simple syrup to cocktail shaker filled halfway with ice. Cover and shake vigorously. Strain into chilled glass. Garnish with lime and pomegranate seeds. 3 large bunches of green basil, leaves removed from the stems. 1. Combine the basil leaves and cucumber slices in the bottle of a cocktail shaker or jar. 2. Muddle the cucumber and basil leaves. 3. Add the simple syrup, lime juice, and vodka with several ice cubes. 4. Shake vigorously to combine. 5. Pour over ice in a highball glass until 3/4 full. 6. Top up with club soda, add a cucumber spear and more basil leaves for garnish. 1. Combine the simple syrup, vodka, and pear nectar in a sturdy glass jar or cocktail shaker filled with ice. 4. Garish with fresh pear, candied ginger, and cinnamon stick. 1. Muddle the all but a few of the tarragon leaves with half of the lemon zest in the bottom of a cocktail shaker or jar. 2. Add the lemon juice, simple syrup, vodka and ice and shake vigorously. 3. Fill a cocktail glass with ice. Fill half of the glass with the cocktail and top up with a mixture of tarkhune and lemonade and champagne. 4. Garnish with lemon zest strips and tarragon leaves. 1. Muddle most the mint and half of the cucumber in a cocktail shaker. Note – you can add a little seltzer or brut to this to make it fizz, but I like the cleaner burn. 1. Combine the egg white, simple syrup, and Aperol in a cocktail shaker without ice. 2. Shake very hard for 20 seconds. 3. Add 1 cup of ice and the grapefruit juice to the shaker and continue to shake vigorously for another 20 seconds. 4. Stain and serve in a chilled cocktail glass. You can also serve in a larger wine glass, over ice with 4 oz of Prosecco. 1. 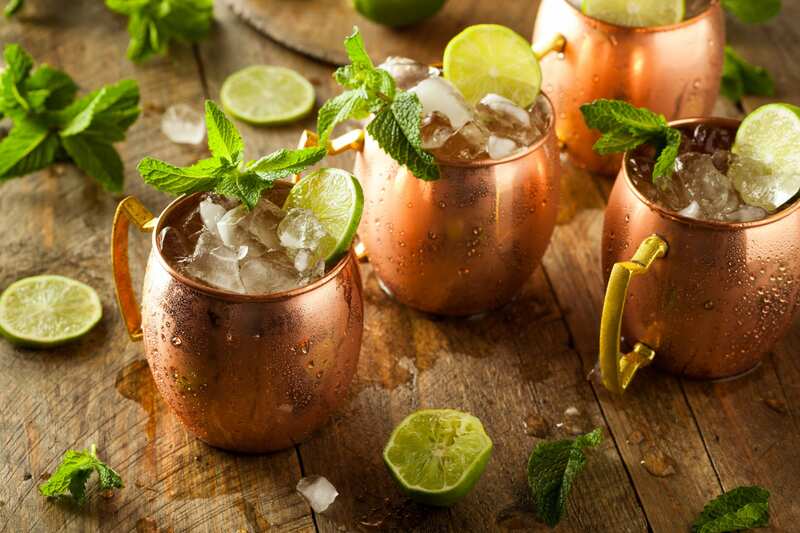 Muddle the mint leaves with the simple syrup in a julep-type glass (ideally metal) — leave for 3 minutes. 2. Add half of the bourbon. 3. Fill the glass with crushed ice. 4. Pour the remainder of the bourbon on top of the crushed ice. 1. Muddle the ginger and the lime juice with the mint in the bottom of a cocktail shaker. 2. Add ice, vodka and the simple syrup. Shake vigorously. 3. Strain through a sieve into a chilled cocktail glass (traditionally copper mugs, but these are not a deal breaker if you don’t have them). 4. Top off with seltzer water and garnish with lime, candied ginger, and mint. A nice idea is to skewer the candied ginger and the lime onto a swizzle stick. So mix up some simple syrup and get cracking on those summer holidays! And send me a line by hitting the comment button below to let me know which one was your favorite! Cocktails inevitably bring on the munchies. Try some of these summertime favorites! Stick around and enjoy these hilarious tales from the world’s largest country! If you enjoyed this post, I’m sure you will love Lenin Lives Next Door: Marriage, Martinis, and Mayhem in Moscow — my first full-length book. 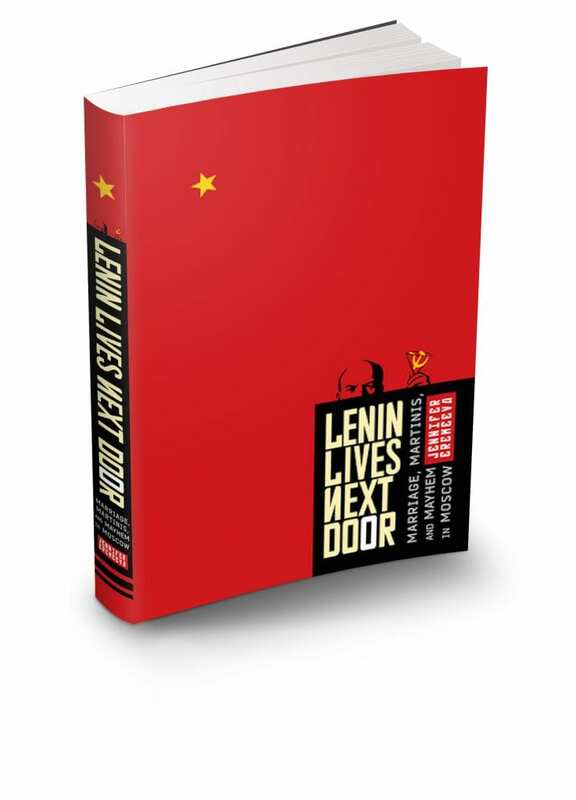 Short-listed for twelve prestigious industry awards, Lenin Lives Next Door has delighted reviewers and readers alike. Now available on iTunes, Kobo, Nook, and Kindle, or at a bookstore near you. You can also listen to Lenin Lives Next Door on audible.com. I read it and it was a lot of fun to record and produce! “An unabashed, hilarious, gutsy work of creative nonfiction, Lenin Lives Next Door is the triple-distilled product of two decades of Eremeeva’s life in Russia. -Dr. Mark Galeotti, Clinical Professor of Global Affairs at New York University’s Center for Global Affairs and an associate member of NYU’s History and Russian & Slavic Studies departments. Jennifer Eremeeva has the keen eye of a David Remnick or Hedrick Smith, but she is a whole lot funnier! Lenin Lives Next Door is a raucous look at how life in Russia has evolved from Soviet days to Putin s time, told by Russia s leading expat humorist…For anyone who appreciates witty prose and great storytelling, the vodka-infused trials and tribulations of Lenin Lives Next Door are a must-read.